Uff! Even if I pretend to be young, I needed some days to recover from the last birthday week end – after three days of partying I still feel a bit blurred. On Friday night, that was actually the day of my birthday, my husband booked a table at Le Bouquet Garni. Even if I love French restaurants, we never had a chance to visit this one during our pretty long stay in Luxembourg. 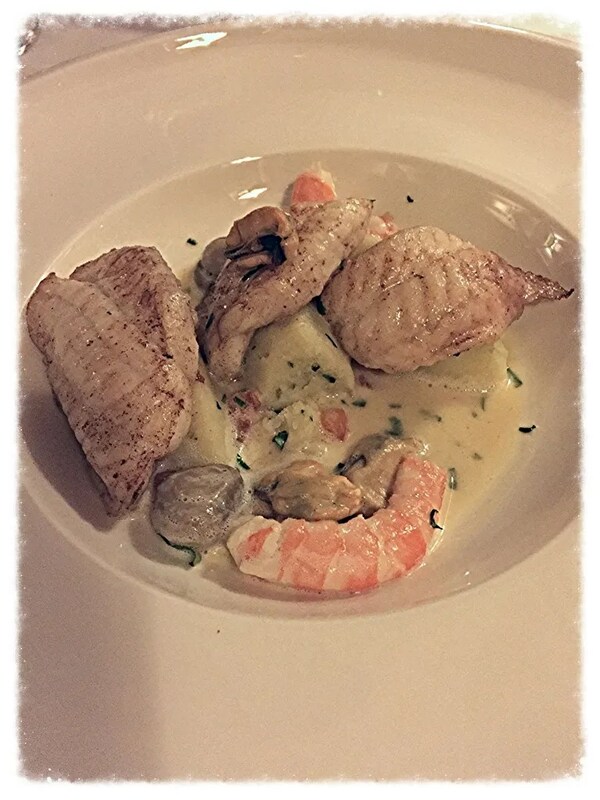 The restaurant is located in the area called “Ilot Gastronomique“, in the Old Town, just behind the Grand Duke Palace. It has preserved traditional settings of the area – stone walls, timbers on view, old furniture. We were welcome in a small entrance and accompanied to our table. The restaurant has different rooms on the two floors and our table was indeed on the first one – just next to the window overlooking the back of the Palais. My husband loved the fireplace, the table was quite big for two persons and the distance with other guests more than appropriate. There are two menu choices: a menu for 40 euro (starter, main, dessert), with brasserie imprint, and a more gastronomic one for 72 euro (again, starter, main, dessert). Both have several choices between fish and meat, plus there is the possibility to upgrade the second menu to four dishes for 85 euro. We had a glass of champagne rose’ as aperitif – on the table there were olives and nuts to enjoy – and we went for the “Menu Selection”: cauliflower welcome from the chef, lobster as starter, sole a la “bonne femme” (with mussels and shrimps) as main and moelleux au chocolat as dessert. We accompanied the dinner with a bottle of Chablis Gran Cru. – The sole and the chocolate cake were just perfect. Amazing combination of tastes, fair portions, great raw materials quality. The sole was accompanied by potatoes mousse that was just delicious, while the dessert was also composed by a yummy fruit sorbet. I am still dreaming about both. 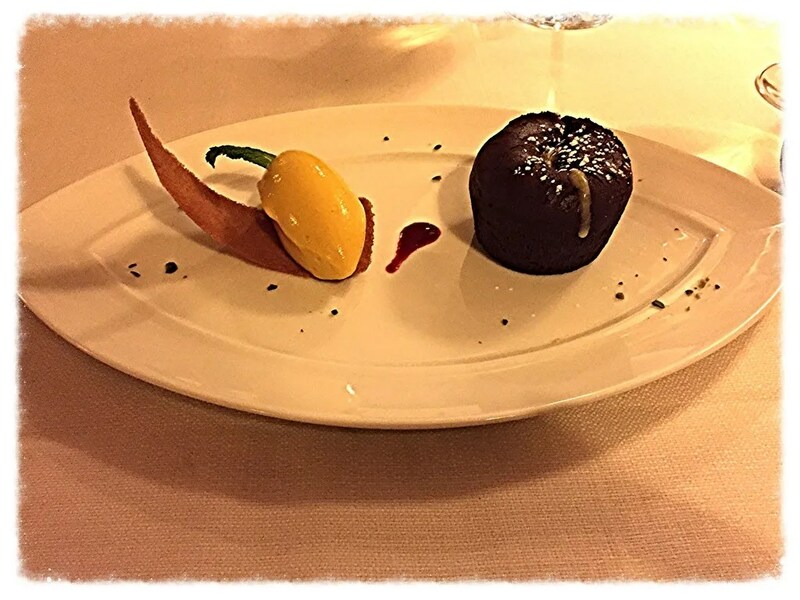 – The service and the settings were great: I really appreciate some distance between tables, the timing of the dinner was almost great, we did not wait too much but it was not even too fast. The bottle of wine was next our table but we were always served by the waiter and our glasses were never empty. – The two menu choices are perfect if you are coming for a dinner with friends – and therefore don’t want to splash the cash – or for a special occasion – like we did. All the dishes were appealing and the portions look correct for the price. – The location is really romantic and perfect for a tete-a-tete. – Overpriced aperitif (and drinks). As said, we ordered a glass of champagne rose’. I have been to the most expensive restaurants in Luxembourg and normally the maximum we paid was 18 euros (with an average of 13/15 euro). The champagne was billed 26 euro per glass – 52 euro for two glasses (!!!!). As it was a blind choice – the waiter asked us if we wanted an aperitif, so we did not have any list in front of us – I really think it was too much. Skip the aperitif if you don’t want bad surprises. Drinks had a pretty high recharge as well – 9 euro for the water, 4 euro each for espresso but in line with other similar restaurants, French wines starting from 40 euro and upgrading very fast. No Italian white wines below 100 euros. What is the sense then of having a 40 euro menu if you are going to spend the double for water, coffee and wine? 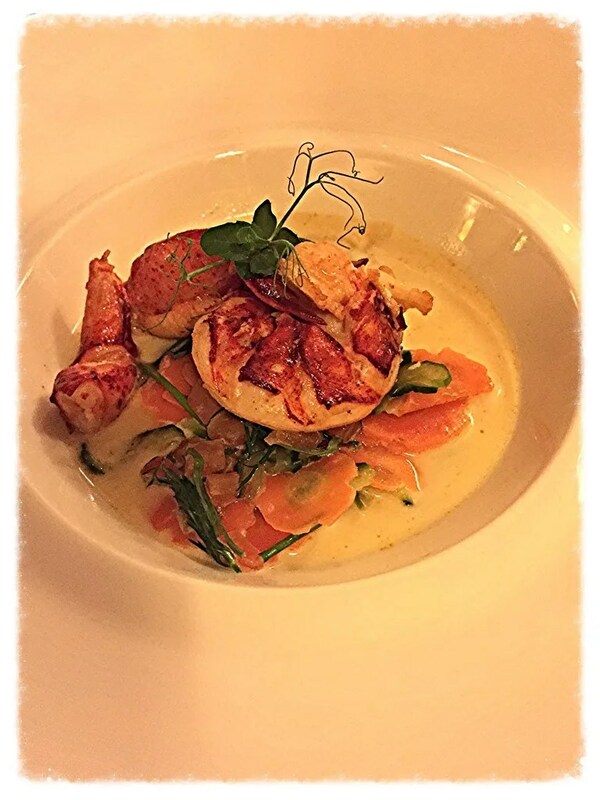 – The lobster of the starter was great, but was accompanied by a light sauce that was made only of vinegar. We were provided a spoon and when I tasted the bisque I was almost disgusted. The lobster alone indeed was very good. – Service a bit worst at the end of the dinner, when the dessert was taken to the table we were still finishing our last glass of wine. We had a very dry wine, so I would have loved to take a sweet glass with the cake. In this way we ended up not finishing our wine and not ordering anything else. 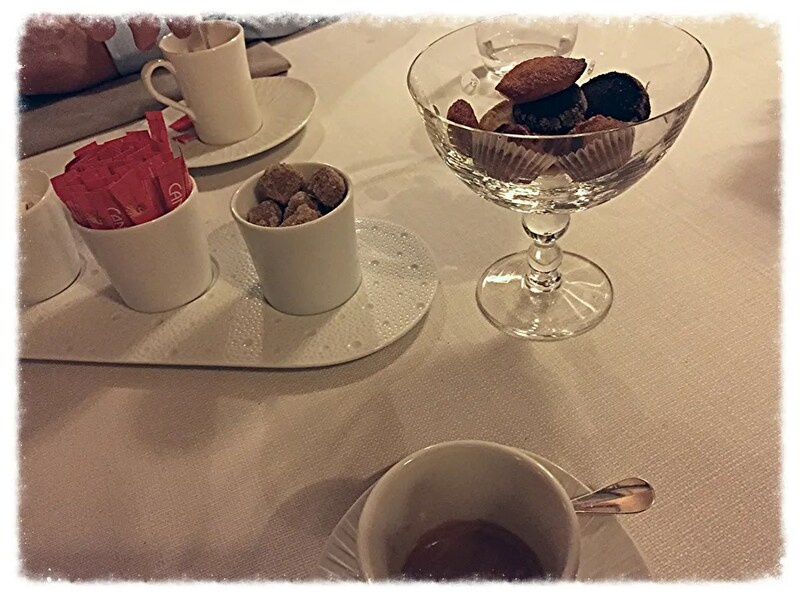 We had also to ask the waiter to wait couple of minutes to serve the coffee as he seemed a bit under pressure for made us leaving – it was not even 11 pm, so not so late and we were not the last table. Even if there are some “bémol”s, I like this restaurant too. It is, as you say, perfect for a romantic dinner. This restaurant is on my to visit list and after reading your review I still think it’s worth a try. The price of the champagne is outrageous though. Thanks for the warning! Anna, thank you very much for your comment and your advise! I will try definitely to improve!